Posted February 14th, 2014 by Martin Welford & filed under Linux, Quartz. Quartz Development Kits Shipping Now! 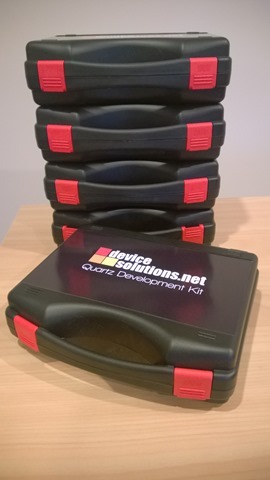 As you can see from the picture, we have Quartz Development Kits in stock! Quartz is based on the Freescale Vybrid chip which is a dual-core ARM Cortex-A5 + M4 part. Here is our quick intro video which shows the key features of the kit. The kits are running a Timesys Linux build. Check out their development centre page for information on the tools that are available FREE to support Quartz software development. Other Operating System ports are in the works including Windows Embedded Compact 2013 and FreeBSD. The kit is designed around the connector version of the Quartz module. This is small (45mm x 35mm x 7mm) , but we have an even smaller surface-mount LGA version (38mm x 38mm x 3mm) for applications where vibration or space is an issue. You can still start your prototyping and evaluation with the development kit and move to the LGA when developing your product. The Quartz Development Kit cost is $399 without LCD and $499 with a 7″ LCD. It can be ordered direct from us here. Posted April 9th, 2014 by Martin Welford & filed under Linux, Quartz. Timesys has launched a Yocto BSP for our Quartz System on Module (SoM) solutions. The Yocto Project is an open source collaboration project that provides templates, tools and methods to help you create custom Linux-based systems for embedded products regardless of the hardware architecture. For details visit the Timesys Yocto site, or the Quartz Development Centre at timesys.com. Posted March 27th, 2014 by Martin Welford & filed under Linux, Quartz. 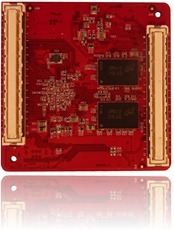 Timesys is our development partner for Linux on Quartz, our latest SOM based on the Freescale Vybrid processor. They have been working with Freescale since the start of the Vybrid project so we think they qualify as experts on all things Vybrid. The main tool set provided with Quartz is the LinuxLink PRO edition suite. This is usually US$5,000, but is free for Quartz development. LinuxLink PRO is a suite of tools for both platform and application development. The best place to get started is the Quartz Development Center page on the Timesys site. This has links to download code and tools along with demos, documentation and getting started videos. Posted April 18th, 2010 by Martin Welford & filed under .NET Micro Framework, Linux, Topaz, Windows CE. 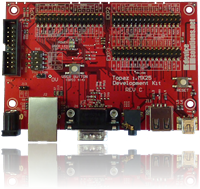 We are very pleased to announce the Topaz i.MX25 CPU Module and Development Kit. 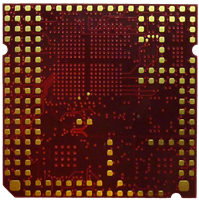 Topaz is a new CPU module designed for portable, industrial and automotive applications. 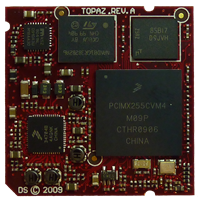 The Topaz module includes a Freescale i.MX25 (400MHz ARM926), 64MBytes mobile DDR, 128MBytes NAND flash, Freescale Power Management IC and Ethernet PHY. Like Meridian, Topaz is a surface mount module. This is easy to mount on new hardware and scales well in volume production. Topaz includes 10/100 Ethernet (just add a MagJack), USB Host and High-Speed OTG ports, LCD controller, Touch-controller, ADC, SD card, CAN, 5x serial ports, PWM, One-Wire, SPI, I2C, Security and more. Check out the product page and data sheet for all the technical details. For Topaz, we worked with partners to support Windows CE and Linux, as well as the .NET Micro Framework. 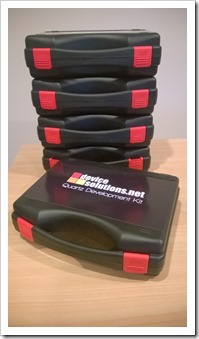 We are shipping today with Windows CE 6.0 R3 in conjunction with GuruCE. The .NET Micro Framework and Linux are in development. Topaz is ideal for portable applications as it uses low-power memory and can be powered from a LiIon cell. For HMI applications, the built-in LCD and touch-screen controllers make it simple to connect a variety of display types. For automotive applications, Freescale supply specific variants of the i.MX25 and these are supported by the Topaz module. 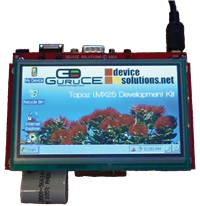 The Development Kit is great for evaluating the Topaz CPU module and development devices. It includes 10/100 Ethernet, Serial, USB host and OTG ports, SD card and audio out. All other signals are available on 0.1” interface headers for easy connection. 4.3” 480×272 TFT LCD with touch-screen. 7” 800×480 TFT LCD with touch-screen. The development kit is priced at US$299 and the LCD kits are US$199 for the 4.3” option and US$299 for the 7” option. These are available from our web shop now, and will be with distributors in the next 2-3 weeks. Posted June 15th, 2010 by Martin Welford & filed under .NET Micro Framework, Linux, Topaz, Windows CE. Posted May 30th, 2012 by Martin Welford & filed under Linux, Topaz, Windows CE. Meet the latest addition to the device solutions module family: the Topaz i.MX25 CPU module in a plug-in, 200-pin SO-DIMM form factor. This is the same circuit as the surface-mount version, so transitioning a design from one to the other is easy. It also has the same world-class operating system support for Windows Embedded CE from GuruCE and Linux from Trygtech. The new form-factor offers excellent flexibility for prototyping new designs, and makes production easier – especially for low-volume products. The surface-mount module is still available and ideal for applications that need a low profile module, or operate in high-vibration environments. The Topaz web page has all the details including an updated Technical Reference Manual and schematic library symbols. Contact us for samples – they are in stock now! Posted June 6th, 2012 by Martin Welford & filed under Linux, Opal, Windows CE. 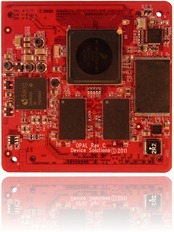 We are very pleased to announce the Opal i.MX53 CPU Module and Development Kit. 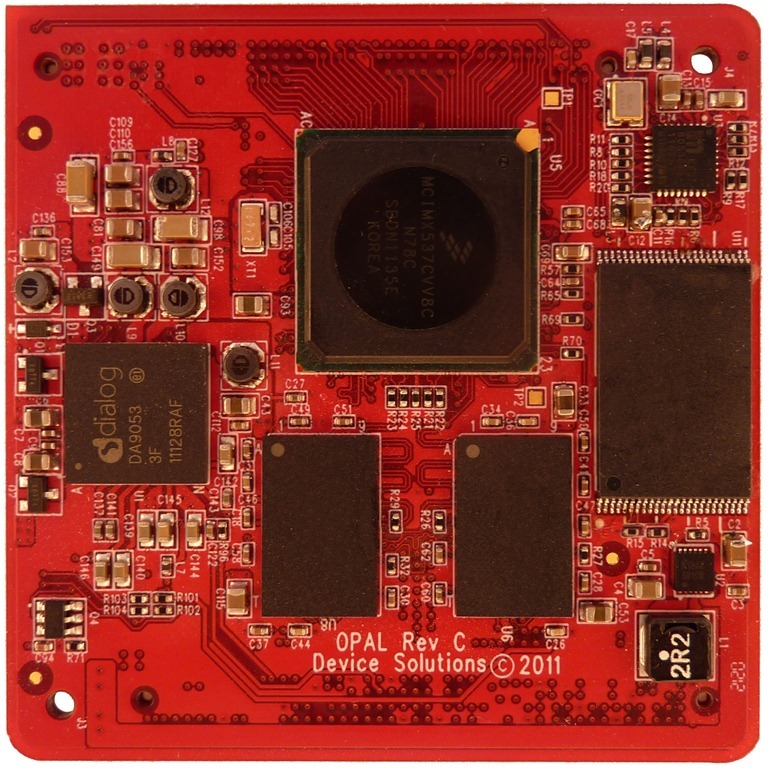 Opal is based on the Freescale i.MX53 processor, and includes up to 1GB DDR3 RAM, NAND flash, power management and an Ethernet PHY. 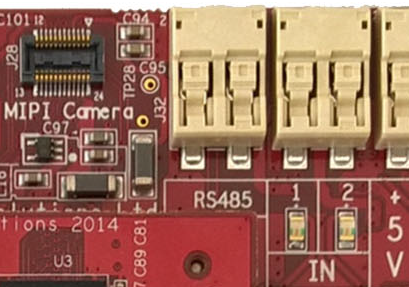 It uses two 168-pin HiRose connectors to interface to a product-specific board. Opal is perfect for devices that have demanding graphics requirements. The i.MX53 supports multiple displays, and includes outputs for TFT LCD panels with parallel and LVDS interfaces, as well as support for analog VGA. There is hardware acceleration for video as well as 2D and 3D graphics up to 1080p. Connectivity highlights include Ethernet, USB and FlexCAN, as well as the usual embedded interfaces like serial, I2C and SPI. Opal is a 60mmx60mm plug-in module. With complex processors like the i.MX53, it can be difficult to strike a balance between exposing all the features, system cost, physical size and mechanical strength. We think the Opal form-factor achieves this for the types of industrial, automotive and medical devices our customers create. For the development kit, we have gone with the “more is more” approach :-) and included Wi-Fi, Bluetooth and GPS. 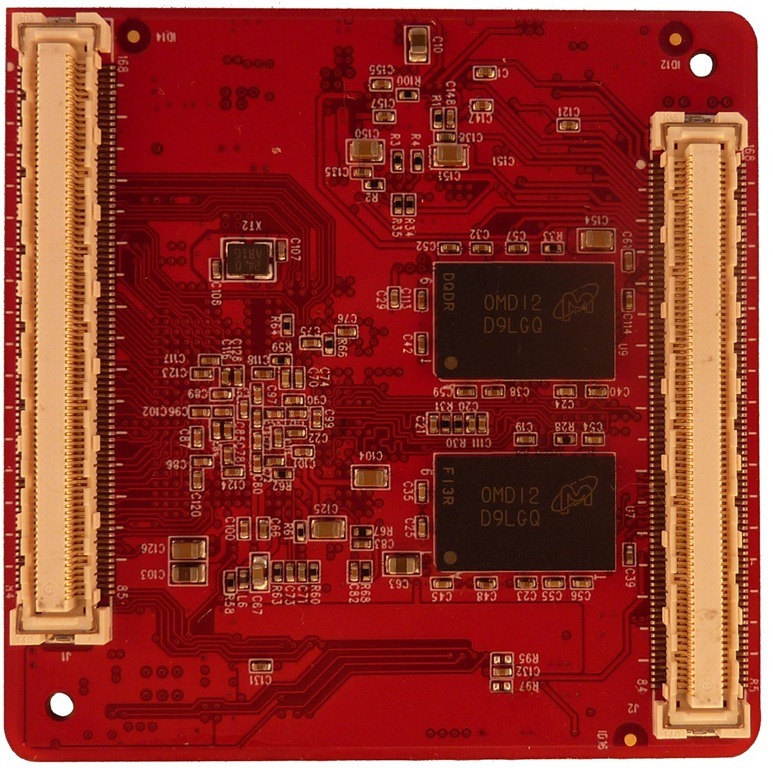 There is also support for 2 LVDS panels (you can connect the Freescale 10.1″ panel used for the Quick Start Board), 7″ touch-screen LCD, CAN transceivers and digital I/O. Another feature we hope will be useful on the development kit is the USB to serial converter for the debug serial port – you no longer have to go looking for your adapter! Initial operating system support will be for Windows Embedded Compact 7 from GuruCE, with Linux and Android to follow from Trygtech. We will have hardware available in July for beta customers with full availability shortly after that. If you think Opal might fit your application we would love to hear from you, and get you on the list for a beta unit.